Atelier Textiles is the UK leader in luxurious hand-embellished textile design and offers a wide choice of fabrics and styles to choose from for your interior home or yacht design project. At the forefront of our industry, we know what is trending and what our clients will be looking for in home textile design. Keeping this in mind, we have created this guide to 2018’s textile trends to help you find the fabrics you need to make any room in your home stand out. Seen in many of the bespoke interior designs by leading home stylists, the tropical theme uses oversized palms and other exotic foliage to add colour and character to a room. Prints with both flora and fauna paired with vibrant colours are leading this trend. 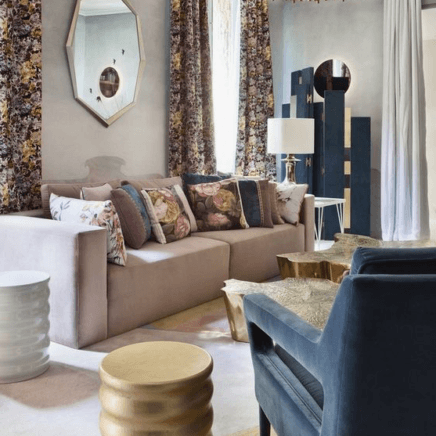 One trend that is showing up increasingly more often in the couture furniture design centres are bold colours that can be added to statement pieces making a pared-down room more interesting. This new trend brings an unmistakably Mediterranean flair to any home. Opulent and iridescent tones provide a lavish look that can turn any room into a showplace. Metallic yarns, foils and strong metallic tones, which are highly polished, add a luxe look, while warmer tones and oxidised metallics create a more masculine ambiance. Florals gained popularity in 2016 at many of the textile industry trade shows and continue to lead the trends into 2018. Mostly bold or large scale floral patterns are enjoying a re-surgence with interior designers as seen in digital print, woven and embroidered textiles.